BAGHDAD, Iraq (CNN) -- Iraqi leaders are applauding President Obama's plan to withdraw most U.S. troops from the country by August 2010. 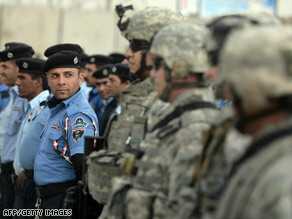 U.S. troops will cede security measures to Iraqi security forces including the police, shown here, and the army. Iraq's Sunni Vice President Tariq al-Hashimi's office released a statement Saturday saying he received a call from U.S. Secretary of State Hillary Clinton informing him of Obama's announcement of the withdrawal. "Mr. al-Hashimi welcomed the American administration's commitment to withdrawing its troops from Iraq according to the agreed-on schedule and stressed that every possible effort should be exerted to increase the readiness of Iraqi security forces and improve their performance," the statement said. Iraqi Prime Minister Nuri al-Maliki said Obama called him to tell him about the plan Friday. The prime minister said Iraqi security forces have proven their ability to provide security across Iraq "which qualifies them to take over full security responsibilities from American forces." Between 35,000 and 50,000 troops will remain to help execute a drawdown plan under which all U.S. forces will be out of Iraq by December 31, 2011. That was a deadline set under an agreement the Bush administration signed with the Iraqi government last year. "Let me say this as plainly as I can: By August 31, 2010, our combat mission in Iraq will end," Obama said in a speech at the Marine Corps' Camp Lejeune, North Carolina. Meanwhile, Iraqi President Jalal Talabani visited neighboring Iran, where the supreme leader warned him that the United States is planning a prolonged stay in Iraq. "Occupying military forces are laying the groundwork for a long-lasting stay in Iraq, and that is a great danger," Ayatollah Ali Khamenei told Talabani on Saturday, according to the state-run Islamic Republic News Agency. "Occupying military forces should leave Iraq as soon as possible," Khamenei said, according to IRNA. "Every day their exit is delayed will be a detriment to the Iraqi nation." On Friday, Talabani met with Iranian President Mahmoud Ahmadinejad, who described Tehran's ties with Iraq as "growing and deep," according to IRNA. The two leaders vowed to expand their political, cultural and security relationships.